Arranging the energy flow in our homes and offices can make a huge difference in how we experience our life. What direction is your bathroom in? Are you flushing away your dreams, passion or wealth? Which direction does your head face when you sleep? Are you absorbing or avoiding the subconscious effect of harmony in relationships, future plans or new beginnings? What about your kitchen? Do you feel nourished on a soul level? Learn to set up a space to create Harmony in Health Love and Life Path. ..and how is YOUR unique energy require different influences than someone else? -especially if you live with them. ** iSOHA is a registered Non- Profit organization based in both the Czech Republic and the USA. This activity is non-profit based. Activity hosts and group consuls are not getting a commission or any other financial benefits for organizing this event. Participants may make a donation (200 Kc suggested/no obligation) if they would like to support the cause of Holistic Healing. Feng shui or Feng Shui(traditional Chinese: 風水; simplified Chinese: 风水, pronounced [fə́ŋ.ʂwèi] ( listen)), also known as Chinese geomancy, is a pseudoscienceoriginating from China, which claims to use energy forces to harmonize individuals with their surrounding environment. The term feng shui literally translates as “wind-water” in English. This is a cultural shorthand taken from the passage of the now-lost Classic of Burialrecorded in Guo Pu‘s commentary: Feng shui is one of the Five Arts of Chinese Metaphysics, classified as physiognomy(observation of appearances through formulas and calculations). The feng shui practice discusses architecture in terms of “invisible forces” that bind the universe, earth, and humanity together, known as qi. As of 2013 the Yangshao and Hongshan cultures provide the earliest known evidence for the use of feng shui. Until the invention of the magnetic compass, feng shui apparently relied on astronomy to find correlations between humans and the universe. In 4000 BC, the doors of Banpo dwellings aligned with the asterism Yingshi just after the winter solstice—this sited the homes for solar gain. During the Zhou era, Yingshi was known as Ding and used to indicate the appropriate time to build a capital city, according to the Shijing. The late Yangshao site at Dadiwan (c. 3500–3000 BC) includes a palace-like building (F901) at the center. The building faces south and borders a large plaza. It stands on a north-south axis with another building that apparently housed communal activities. Regional communities may have used the complex. A grave at Puyang (around 4000 BC) that contains mosaics— actually a Chinese star map of the Dragon and Tiger asterisms and Beidou (the Big Dipper, Ladle or Bushel)— is oriented along a north-south axis.The presence of both round and square shapes in the Puyang tomb, at Hongshan ceremonial centers and at the late Longshan settlement at Lutaigang, suggests that gaitian cosmography (heaven-round, earth-square) existed in Chinese society long before it appeared in the Zhoubi Suanjing. Beginning with palatial structures at Erlitou, all capital cities of China followed rules of feng shui for their design and layout. During the Zhou era, the Kaogong ji (simplified Chinese: 考工记; traditional Chinese: 考工記; “manual of Crafts”) codified these rules. The carpenter’s manual Lu ban jing (simplified Chinese: 鲁班经; traditional Chinese: 魯班經; “Lu ban’s manuscript”) codified rules for builders. Graves and tombs also followed rules of feng shui, from Puyang to Mawangdui and beyond. From the earliest records, the structures of the graves and dwellings seem to have followed the same rules. The history of feng shui covers 3,500+ years before the invention of the magnetic compass. It originated in Chinese astronomy. Some current techniques can be traced to NeolithicChina, while others were added later (most notably the Han dynasty, the Tang, the Song, and the Ming). The astronomical history of feng shui is evident in the development of instruments and techniques. According to the Zhouli, the original feng shui instrument may have been a gnomon. 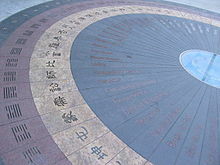 Chinese used circumpolar stars to determine the north-south axis of settlements. This technique explains why Shang palaces at Xiaotun lie 10° east of due north. In some of the cases, as Paul Wheatleyobserved, they bisected the angle between the directions of the rising and setting sun to find north. This technique provided the more precise alignments of the Shang walls at Yanshi and Zhengzhou. Rituals for using a feng shui instrument required a diviner to examine current sky phenomena to set the device and adjust their position in relation to the device. The oldest examples of instruments used for feng shui are liurenastrolabes, also known as shi. These consist of a lacquered, two-sided board with astronomical sightlines. The earliest examples of liuren astrolabes have been unearthed from tombs that date between 278 BC and 209 BC. Along with divination for Da Liu Ren the boards were commonly used to chart the motion of Taiyi through the nine palaces.The markings on a liuren/shi and the first magnetic compasses are virtually identical. The goal of feng shui as practiced today is to situate the human-built environment on spots with good qi, an imagined form of “energy”. The “perfect spot” is a location and an axis in time. Qi（氣）(pronounced “chee” in English) is a movable positive or negative life force which plays an essential role in feng shui. The Book of Burial says that burial takes advantage of “vital qi“. Wu Yuanyin (Qing dynasty) said that vital qi was “congealed qi“, which is the state of qi that engenders life. The goal of feng shui is to take advantage of vital qi by appropriate siting of graves and structures. Some people destroyed graveyards of their enemies to weaken their qi. One use for a loupan is to detect the flow of qi.Magnetic compasses reflect local geomagnetism which includes geomagnetically induced currents caused by space weather.Professor Max Knoll suggested in a 1951 lecture that qi is a form of solar radiation. As space weather changes over time, and the quality of qi rises and falls over time, feng shui with a compass might be considered a form of divination that assesses the quality of the local environment—including the effects of space weather. Often people with good karma live in land with good qi. The diagrams are also linked with the sifang (four directions) method of divination used during the Shang dynasty. The sifang is much older, however. It was used at Niuheliang, and figured large in Hongshan culture‘s astronomy. And it is this area of China that is linked to Yellow Emperor (Huangdi) who allegedly invented the south-pointing spoon (see compass). The Form School is the oldest school of feng shui. Qing Wuzi in the Han dynasty describes it in the “Book of the Tomb”  and Guo Pu of the Jin dynasty follows up with a more complete description in The Book of Burial. The “form” in Form School refers to the shape of the environment, such as mountains, rivers, plateaus, buildings, and general surroundings. It considers the five celestial animals (phoenix, green dragon, white tiger, black turtle, and the yellow snake), the yin-yang concept and the traditional five elements (Wu Xing: wood, fire, earth, metal, and water).